This SEO update includes TONS of new features to help you slide your way to the top of the search engines. SEO Tab gives you control over each page! SEO HTML View lets you see how your website looks when not viewed with Flash (the way a search engine sees the site). 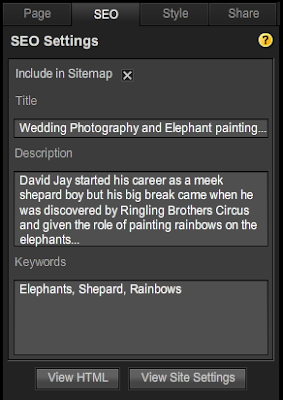 Sitemap for your website is auto-generated and we make it super easy to submit that to Google. Now you have control to include images, music and even videos in the HTML so that the search engines and iPhones can see it as well. 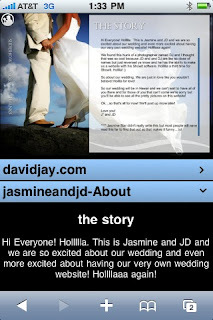 This gets really cool when you log into your website on your iPhone! Next week we'll be doing a live Webinar to show you how to take advantage of these features, but for now you can read the articles that explain these features on the Wiki. You guys are fab. This is exactly why we can't stop spreading the name of Show It Sites! This is why I got a lifetime membership. You guys are ****** awesome. Sweeeeet! Stoked you guys are spreading the love! WE LOVE YOU!!! Incredible DJ! I know I'm going to get only the best with you guys. ;) So exciting and HELPFUL with my new launch! Love the update. I've been a lifer for a year now and I couldn't be happier. I was at the Apple store and my wife brought the site up full-screen on a 30" cinema display and everything was crisp as could be. My site is http://www.christopherwrenphoto.com. Thanks DJ!